UFW Stories: "MY MEMORIES WITH 'EL JEFE' CESAR E. CHAVEZ"
"MY MEMORIES WITH 'EL JEFE' CESAR E. CHAVEZ"
1969-1977 Actor and playwright performing at UFW events in support of its struggle for justice in the fields. 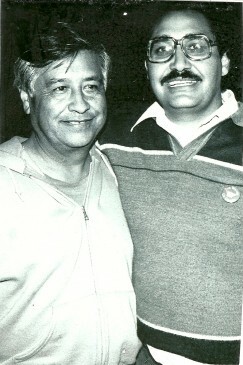 1981 Helped to organize a fund raising event for the UFW in Los Angeles, CA. Met Cesar and invited me to visit La Paz. Visited the UFW headquarters during 1981 Memorial Day and CEC convinced me to help UFW in developing a radio station for farm workers. This effort planted the seed for ‘The Wire”, a microwave radio station broadcasting UFW news and reports from La Paz’ kitchen to all field offices across the state of California. 1982-1984 Help in resuscitating, “El Malcriado”, the union’s newspaper. Wrote stories, trained farm workers how to report labor related stories for El Malcriado. Co founder of KUFW radio and named the station: Radio Campesina. Prepared news and musical programs for farm workers. Occasionally drove CEC all over the State of California and traveled with him coordinating his security, political events and preparing him for media events. 1985 Grape Boycott Director for the Pacific Northwest and Mid and Western Canadian Provinces. Coordinated CEC tours and media events and raised monies and support for UFW new grape boycott. Helped in preparing farms workers to appear on the UFW’s TV spots “Como Siempre”. Studied at the UFW Law clinic immigration and labor law. Coordinated efforts in finding pesticide poisoned victims for the film: The Wrath of Grapes. 1986 Public Relations Director for the UFW. Responsible to publish El Malcriado Magazine, Food and Justice Magazine and ‘The Migrant, a CEC column to be published at thousands of labor publications in the US and Canada. 1987 LEFT THE UFW TO WORK FOR THE ANGELES FEDERATION OF LABOR TO LEGALIZE UNDOCUMENTED UNION WORKERS UNDER THE AMNESTY PROGRAM. CONTINUED SUPPORTING THE UFW AND CEC. 1992 CEC invited me to help farm workers legalize their immigration status under the SAW program. This effort was coordinated with CEC’s assistant Cecilia Ruiz. 1993 Participated as coordinator of CEC’s pallbearers during his funeral in Delano, CA. 1998 Paul Chavez, Cesar’s son, invited me to return to the UFW to work for KUFW radio in Bakersfield. 2001 Helped the UFW in San Antonio, Texas to process immigration cases at its office. 2007 Board member of the Cesar Chavez Legacy and Educational Foundation in San Antonio, Texas as the immigrant rights coordinator. Continued supporting farm workers in their struggle for social justice and promoting Cesar’s legacy.